Oliver Jeffers: 15 Years of Picturing Books is organized by National Center for Children’s Illustrated Literature (Abilene, TX). 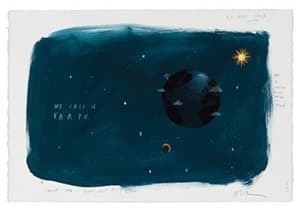 Oliver Jeffers is a visual artist and author working in painting, bookmaking, illustration, collage, performance, and sculpture. Curiosity and humor are underlying themes throughout his practice as an artist and storyteller, resulting in books loved by both children and adults. Jeffers’ critically acclaimed picture books have been translated into over 40 languages and sold over 10 million copies worldwide. At Joslyn, see 80 line drawings, sketches, and finished illustrations for sixteen children’s picture books including the wildly popular The Day the Crayons Quit and its sequel, The Day the Crayons Came Home, and Jeffers’ most recent book, Here We Are, a sort of user’s guide to life on Earth—all The New York Times #1 Bestsellers. Hours may change for special exhibitions. *New Year’s Day; Memorial Day; Independence Day; Labor Day; Thanksgiving Day; and Christmas Day. Additional charge for some special exhibitions. Upcoming ticketed exhibitions: Pattern and Purpose: American Quilts from Shelburne Museum, 30 Americans, The Art of Seating: 200 Years of American Design, and Word and Image: The St. John’s Bible. Joslyn’s Hitchcock Museum Shop is open during all regular Museum hours.